This brilliant film based on the graphic novel by Alan Moore, carries its oppressive message that will certainly help us remember, remember, the fifth of November. 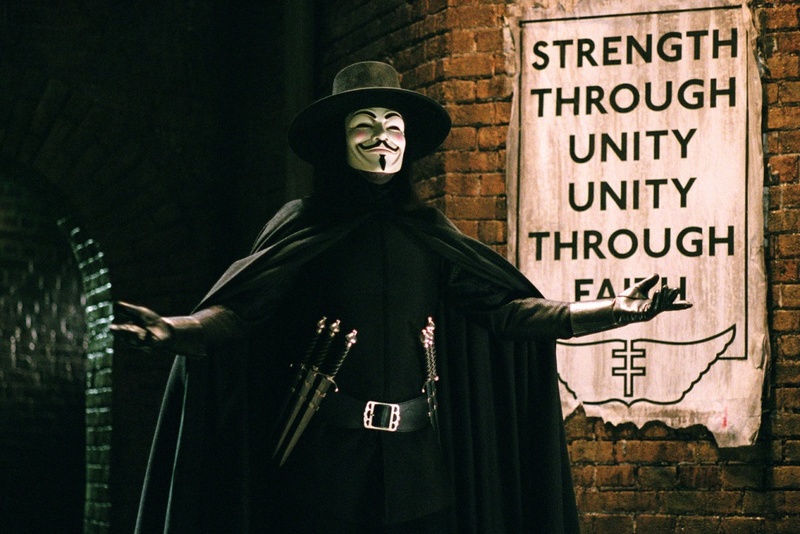 V for Vendetta is set in a dystopian London which has become a fascist regime led by Adam Sutler (John Hurt). He is faced against V (Hugo Weaving) a freedom fighter wanting revenge on those who disfigured him. A working class girl named Evey (Natalie Portman) becomes caught up in V’s mission for freedom whilst a detective (Stephen Rea) tries to stop V from igniting a revolution. What I believe makes this film so special is the message, the message being a warning to the dangers of totalitarianism. The film features interesting aspects of a fascist state which would make George Orwell spin in his grave, like the regime listening to citizens conversations in their very own homes and people who are considered “undesirable” such as political prisoners and homosexuals being sent to concentration camps. Speaking of George Orwell, there’s also so many aspects of this film which remind me of my favourite book, Nineteen Eighty-Four, such as Sutler constantly appearing on large screens and as a cult of personality in citizen’s homes which is reminiscent to Big Brother’s image. Coincidently, John Hurt portrayed Winston Smith in the 1984 film adaptation of Nineteen Eighty-Four. V for Vendetta also features so many 21st century fears of a totalitarian state such as surveillance, torture, religious hypocrisy and media manipulation. Apart from this deep message, the screenplay by the Wachowski’s is very well done, providing the audience with a balance of political philosophy and thrilling action. Weaving portrays V brilliantly, making the audience mesmerised by his character’s desperation for total freedom all whilst being a genius in explosives, sword fighting, literature, philosophy and his personal favourite: gardening. In addition, the performances by Portman, Hurt and Rea have a great balance between choice, power and detection. Apart from that mere opinion, this is a meaningful film with an important message that is worth watching. A excellent debut from James McTeigue which is touching, interesting and has a very clear warning.